In the Arizona Fall League, the surprises don't end with the Saguaros. Baseball's version of a prospect finishing school is loaded with hype and justifiably so. Many of the game's best young future stars head to the Southwest to make up for lost at-bats, try to prove their worth before 40-man roster decisions or just learn a last few valuable lessons against top-notch competition before the book closes on the calendar year. Along those lines, there are always prospects fulfilling expectations. For instance, Keston Hiura has shown off an impressive hit tool, Peter Alonso has delivered tremendous power and Vladimir Guerrero Jr. has stood out in both categories. Tyler Nevin, Rockies first baseman/third baseman, Salt River: Colorado's No. 11 prospect runs into the same questions many farmhands in the organization do. Yes, he was a solid hitter at Rookie-level Grand Junction, Class A Asheville and Class A Advanced Lancaster with a career .305 average and .833 OPS, but those are all extremely hitter-friendly home parks. For instance, 11 of his 13 home runs this season in the California League came at Lancaster's The Hangar alone. Could he hit elsewhere? Not only has he done so in the Fall League thus far, he can stake a claim as the circuit's best hitter through the first half. Following the Fall Stars Game, Nevin is the AFL leader in average (.436), on-base percentage (.538) and OPS (1.179). The over-the-fence power hasn't been there (no homers, three triples, two doubles), but he is starring in the patience and contact departments as well, having walked 11 times and struck out only twice in 52 plate appearances. Nevin's primary AFL directive was to pick up at-bats after struggling with health in his first four Minor League seasons, but he's proving he's more than just a good hitter in some of the best hitting environments in the Minors. Daulton Varsho, D-backs catcher, Salt River: The expectations here have less to do with Varsho himself and more to do with the general expectations about backstops. Since 2000, only two catchers have stolen 15 or more bases in a single season -- Jason Kendall and Russell Martin, both of whom did it twice. If there's anyone in the current game from the Majors or Minors primed to join that club next, it's Varsho. Arizona's No. 5 prospect is an interesting athletic specimen as a backstop with a plus run tool, and it's shown in the Fall League, where he has seven steals in nine attempts over nine games. No other AFL catcher has more than one stolen base. Add that to the 19 he swiped at Class A Advanced Visalia, and the 22-year-old has already cracked the 20-steal threshold for the calendar year. Isiah Kiner-Falefa led Major League catchers with seven steals this season, but it's difficult not to envision a future in which Varsho laps the field in that category. Ryan McKenna, Orioles center fielder, Glendale: As outlined in last Friday's Toolshed, there were a lot of reasons to jump on the McKenna bandwagon in the first half of 2018, namely his .377/.467/.556 line in 67 games at Class A Advanced Frederick. However, a .239/.341/.338 line and 96 wRC+ over 60 games in the second half following a jump to Double-A Bowie may have applied some brakes to that bandwagon and highlighted McKenna's overall limitations against tougher pitching. But it's back to full-steam ahead as Baltimore's No. 12 prospect has picked things up in the AFL, leading the circuit with a .647 slugging percentage and ranking second with a 1.131 OPS while hitting .373 over 13 games. It's a small sample, of course, but with the way McKenna faded down the stretch at his first taste of the upper levels, it's a solid boost to his profile that he's rebounded this well in Arizona. With everything that's gone on, there are fewer reasons to doubt McKenna won't show at least an average bat when he arrives in the Majors, perhaps as early as next season. Braxton Davidson, Braves first baseman, Peoria: Atlanta took Davidson with the 32nd overall pick in the 2014 Draft, but the North Carolina native hasn't been ranked among the top-30 Braves prospects since the end of the 2016 season. Some of that has to do with the amount of talent Atlanta has added to the Minor League ranks since then. But more so, it's because Davidson has stalled out at Class A Advanced, where he's yet to produce an OPS above .704 and has struck out at least 35.7 percent of the time in each of his three seasons at the level. Davidson, however, showed some increased pop in 2018 with a career-high 20 homers in 121 games with Florida, and he's carried that over pretty easily to the Fall League. His five long balls lead the circuit, despite the fact he's only played a dozen games for the Javelinas. With 11 hits total, almost half of his knocks have gone over the fence. With 22 strikeouts, he's still struggling to make consistent contact, but with this level of power, the 22-year-old is still showing future value for Atlanta. 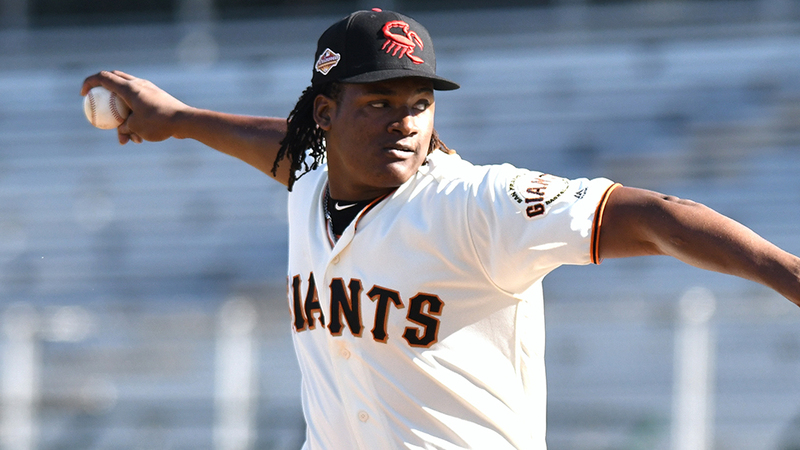 Melvin Adon, Giants right-hander, Scottsdale: San Francisco has tried to make its No. 19 prospect into a starter since signing him out of the Dominican Republic in 2015, but Adon has shown this autumn that he might be better suited as a bullpen stud. The No. 19 Giants prospect has touched triple-digits at times in the Fall League and been nearly untouchable in shorter stints. (None of his appearances have lasted longer than two innings.) His 0.52 WHIP in seven outings is lowest among AFL qualified pitchers while he's fanned 19 and walked only two. The 24-year-old right-hander also showed off an impressive slider when he caught Guerrero looking for a strikeout in the Fall Stars Game. Adon is coming off a regular season in which he posted a 4.87 ERA and a 1.49 WHIP over 77 2/3 innings at Class A Advanced San Jose, so given his age, it might be time to abandon the starting pitching experiment anyway. The way his stuff is dominating a good group of bats in the Fall League, it is time to see how quickly he can move toward the Bay Area in a relief role. Nico Hoerner, Cubs shortstop, Mesa: There's a lot working against Hoerner's chances of being a solid contributor in the AFL. With his college season starting back in February, it's been a long campaign for the Stanford product. As the only 2018 Draft pick to head to the Fall League, he's got the least pro experience of anyone with a roster spot. Specifically, he played only 14 games in the Chicago system over the summer. He's also coming off an elbow injury that cost him roughly the final six weeks of the regular season. And yet, the Cubs' No. 6 prospect has still been rather productive in his first professional fall, putting together a .349/.373/.492 line with one homer, two triples and two doubles in 15 games with the Solar Sox. The jury's still out whether he'll stick at shortstop or move over to second base (where he's made one start this fall) long-term, but if he can handle himself this well with the bat after all that's happened in 2018, the future is looking on the up-and-up for the Cardinal-turned-Cub. Buddy Reed, Padres center fielder, Peoria: The 2016 second-round pick out of Florida put himself back on a loaded San Diego map when he opened the season hitting .324/.371/.549 with 12 homers and 33 steals in 79 games at Class A Advanced Lake Elsinore. But as was the case with McKenna, that production looked more like an outlier after the switch-hitter produced just a .179/.227/.235 line with only one homer in 43 games at Double-A San Antonio to end the season. Like Nevin, it was enough to question whether the California League may have played a part in inflating those numbers. Now, though, there's little doubt the real outlier may have been those Texas League stats, given the way Reed has bounced back in Arizona. As of the weekend, he's batting .375/.423/.500 with a triple, four doubles and five stolen bases through 12 games for the Javelinas. What's more, he was named Fall Stars Game MVP on Saturday after hitting a game-tying RBI triple and scored the game-winning run in the West's 7-6 walk-off victory. On that extra-base hit, the Padres' No. 13 prospect choked up immensely against hard-throwing Rockies right-hander Justin Lawrence and drove the ball the other way to left-center, showing off how a more direct path to the ball has helped him offensively during the good times of 2018. He's certainly added to the plus column with his play this autumn.